Discover one of the most beautiful wine routes : the Route des Châteaux du Médoc, along the left bank of the Gironde! Starting point for guiding services : Previously fixed meeting points such as the Lamarque landing stage or the 17th century Cussac-Fort-Médoc fort. The Route des Château du Médoc, the equivalent of Route 66 for wine lovers! The Médoc wine route and its picturesque D2 (departemental road), departs from Bordeaux and go north along the Médoc peninsula. It will winds its way through 8 of the most famous wine appellations of Bordeaux wines! Finally, the communes from north to south: Saint-Estèphe, Pauillac, Saint Julien, Margaux, Listrac and Moulis. On the one side : , the Gironde estuary; on the other side, vast forests created by man, protecting the vines from violent winds coming from the Wwest and the Atlantic Ocean. 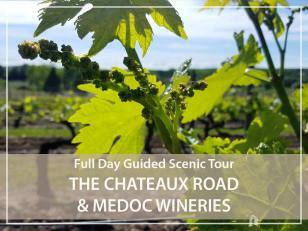 Let's follow the Médoc wine route for an wine trip in the heart of the beautiful vineyards of Bordeaux and its famous wines all over the world! photo stops to discover and admire the facades of sumptuous "cwine chateaux" often rebuilt in the 19th century. to understand the terroirs: sandy, gravelly, gravelly, gravelly hills interspersed with swampy areas. Possibility to include cultural visits such as the city of Pauillac or the Fort-Médoc, which is part of the famous Vauban's bolt developed over the width of the Gironde estuary. Between the 8 different appellations that follow one another, the 1855 official classification of Bordeaux wines, the middle-class crus, the artisanal crus... Not easy to find one another and you will tell me: how to choose a Médoc wine that deserves its price? My work as a guide will be to explain the different terroirs of the Médoc wine making area, the different grape varieties used and the different aromas that can be expressed in our Médoc wines. There is no secret recipe. There is no advice that prevails... Like everything else, it is again a matter of taste! When you will have the keys to unlock the pretended complexity of the Médoc wines, it is up to each of you to get inspired by them and go and see and taste them, of course with moderation! Then, it is up to each of you to make your own wine classification! or the XVIIth century Fort-Médoc, which is part of Vauban's bolt developed over the width of the Gironde estuary. End of the services at the previously established meeting-point: ferry dock in Lamarque or the 17th century fort in Cussac.